The Bible And The Influence It Had On America's Founding! The Bible And The Influence It Had On America’s Founding! 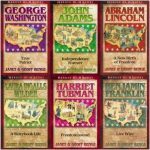 Foundations Of Freedom Part One! 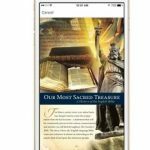 The Bible And The Influence It Had On America’s Founding: All this week we will be sharing a special presentation from Foundations of Freedom! We’ll be having special guests coming on each day so stay tuned throughout the week! Today, we will be discussing what the Founders said about the Bible and the influence it had on America. Welcome to the intersection of faith and the culture. This is WallBuilders Live! Thanks for joining us today. Going to be talking about some of the hottest topics on policy, and faith, and the culture. All of that from a Biblical, historical, and constitutional perspective. David Barton, Tim Barton, and myself, Rick Green are normally your hosts here on WallBuilders Live. But we’ve got something special coming up this week. All this week you’re going to get to hear some Foundations of Freedom. It’s the latest television program from WallBuilders. You can see it across the country on television or you can listen to it right here on WallBuildersLive. You can visit our website at WallBuilders.com if you’d like to pick up the full DVD set. Lots of great guest stars in there. Congresswoman Michele Bachmann, Glenn Beck, and others. This week we’re going to share with you four of those programs. We are just going to play them straight through this week. Some fantastic topics you’re going to enjoy. We’re going to be talking about the Founders Bible. We’re talking about what the founders said about the Bible and the influence of the Bible in America. And we’re going to move into the Foundations of Law with Michele Bachmann. So some great material coming up over the next few days. We’re going to dive in right now with that first episode. 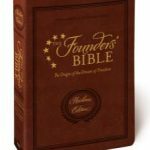 This is the Founders Bible, it’s part of Foundations of Freedom with David Barton. Join historian David Barton with special guests Glenn Beck, Congresswoman Michele Bachmann, and more as they explore the America our Founding Fathers envisioned. What if America’s story is bolder, more colorful, and more compelling than you ever imagined? This is Foundations of Freedom. Welcome to Foundations of Freedom. We’ll look at important aspects of our common heritage that very few folks today hear anything about. Joining me today is Rick Green. Rick is an attorney, he’s a former legislator, he’s an author of numerous books, and he’s also the head of Patriot Academy which is a wonderful youth program that teaches young people how to be our future civil leaders. Rick, you and I also co-host a daily radio program heard nationally and it’s an honor to have you with us. It’s my privilege to be with you. I’m looking forward to talking about Foundations of Freedom because it seems like we’re losing some of those freedoms and people who are hungry, they want to know: What are the Foundations? How did we become so successful as a nation? And why are we losing it? I think most of the time we think about foundational documents as the Constitution and Declaration. Our topic today, we’re going to talk about the Bible. Maybe most people don’t recognize that as a foundational document of America. And when they looked to see what the Founding Fathers and others in that era quoted the Bible was the number one source far and away more than any other source. The Bible was the most frequently quoted source. So it is a founding document of America, no question. We’ve got some questions from our audience about the role of the Bible in our culture today so let’s go to some of those. Well, here we’re talking about the Bible as a founding document. Some people don’t want to hear it at all in the culture. Maybe they feel like you’re preaching at them even when you just quoted the Bible. That’s one of the things that most folks today don’t know. But to say, “I don’t want to hear the Bible injected.” Too late, already there. A good example, we have over 250 idioms that we use on a daily basis that is direct quotations out of the Bible, you hear this all the time. A great book on that, this book, professors, they’ve gone through and just documented what we say to each other that is from the Bible like, “By the skin of your teeth.” That’s in Job.“I’ll give you my two cents worth.” That’s out of Mark. I use that one all the time. So people are using these? I was about to say, they’re using it. The ones that are complaining about it, they’re actually quoting it. They just don’t don’t have a clue. So, to say that we shouldn’t be injecting the Bible in things today, we wouldn’t be America, we wouldn’t even have our language, we wouldn’t have our fine arts and entertainment, we wouldn’t have what we enjoy today if the Bible hadn’t been injected into it. It’s been there from the beginning. When Is The Right Time For Youth To Study The Bible? Alright, on to another question. Hi, I’m really involved with the youth activities at my church. And so I was wondering when you thought was the right time for youth to start reading and really study the Bible? That’s a great question, I’m curious myself. I’ve got four kids. So what is the right time to start training them or giving them the opportunity to study the Bible? Well, you’ve got examples from both Bible and from American history. When you look at American history the right time to start training them is when they start learning to read. For example, when Washington, D.C. became the national capital, we had first been back in New York City for a year and then in Philadelphia for 10 years and then in 1800, we moved into Washington, D.C.
“I’m a little busy,” right? “I’m a little busy but I’ll help you.” And so Thomas Jefferson is credited with outlining and forming the plan of education for Washington, D.C. public schools. And when you look at the very first report of Washington, D.C. Public Schools it’s interesting that they say that students learned to read from two books. This is a public school. And Thomas Jefferson who is credited as being the guy who, “Oh, no, he wanted a secular society.” He’s the guy who came up with this plan of education. I’m amazed by two things. First of all, that they were reading the Bible. But also, five syllables? I don’t know if I know any five syllable words, they are reading five syllable words. And this is where this starting. So when did they begin? Well, you take, for example, Harriet Beecher Stowe she wrote Uncle Tom’s Cabin. When she was 7 years old she’d already memorize 27 hymns and she knew several chapters out of the Bible. Let’s not stop with the Harriet Beecher Stowe. Let’s go to John Witherspoon, signer of the Declaration of Independence and president of Princeton. When he was four years old he’d already read the King James Bible through from cover to cover. So four years old he’s already read this cover to cover. A four-year-old reading at all is amazing. You have George Wythe, a signer of the Declaration of Independence. When he was three years old he was already studying and reading the classics. 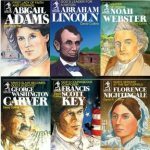 Daniel Webster, when he was six years old in a public school memorization contest he memorized scores of Bible verses in one day at a public school. So, this is typical. I guess the final proof of that is this little book right here. This is the first textbook ever printed in America is called the New England Primer. For 240 years students learned to read out of this book. This is when they’re in words of three syllables. Here’s your memory work, the letter “a.” “A wise son makes a glad father but a foolish son is the heaviness of his mother.” That’s a Bible verse. “B, better is a little with the fear of the Lord than great treasure and trouble therewith.” That’s a Bible verse. “C, come unto Christ all ye that labor and are heavy laden, he will give you rest.” That’s a Bible verse. They have no basis, “Oh Mom, you can’t teach me that. I’m too young for that.” It’s the expectations we put on them. And so you see from American history what we do here. This little book right here, a fun little book done by President John Quincy Adams. He did this book and it shows 10-year-old Americans how to read the Bible from cover to cover once every year, 10-year-old Americans. A book from the president on how to read the Bible cover to cover. That’s our history and that’s our heritage. We were into the Bible, the Founding Fathers were in the Bible. Let me go to a guy named Fisher Ames. Most folks today have never heard of Fisher Ames. Fisher James is a framer of the Bill of Rights. He is the guy credited with coming up with the House language for the First Amendment of the Constitution. This is where we have our freedom of religion. So, there’s the guy who gave us the First Amendment, the House version of First Amendment, and he said, “Don’t ever let the Bible drift the back of classrooms.” So that’s how he was educated. And had seen the results of a generation raised with that being the main textbook. That’s the way we’ve done in America. The very first public school law we have in America in 1647 it was passed to make sure the students knew the Bible because then you could understand how the government was supposed to operate. You understand how the courts are supposed to operate, and you’d make sure civil atrocities didn’t get introduced like they had in Europe. Knowing the Bible is really key. You’ve got folks here, like Benjamin Rush, signer of the Declaration. John Adams said that he’s one of the three most notable signers. Benjamin Rush is called, “the father of public schools” under the Constitution. So you’d think, “Hey, that’s a pretty important guy.” Not today. We don’t talk about him. And it could be because right here, in this piece he goes through in 1790 and 91 and gives a dozen reasons why will never take the Bible out of public schools in America. A dozen reasons why it will always be our number one textbook. And in explaining it, he gave a great warning to future generations. It’s like a prophecy coming true today. Yeah, exactly. And see what happened, in 1963, in two cases at the U.S. Supreme Court *** announced out of the clear blue, “Time to take the Bible out of schools. Yeah, we’ve been doing it for 300 years but it’s time to go.” And the court said, “There is no historical precedent or legal precedent for what they did.” So they took it out. Have you ever wanted to learn more about the United States Constitution but just felt like, man, the classes are boring or it’s just that old language from 200 years ago or I don’t know where to start? People want to know. But it gets frustrating because you don’t know where to look for truth about the Constitution either. Well, we’ve got a special program for you available now called Constitution Alive with David Barton and Rick Green. It’s actually a teaching done on the Constitution at Independence Hall in the very room where the Constitution was framed. We take you both to Philadelphia, the Cradle of Liberty and Independence Hall and to the WallBuilders’ library where David Barton brings the history to life to teach the original intent of our Founding Fathers. 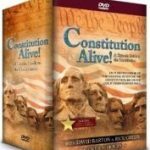 We call it the QuickStart guide to the Constitution because in just a few hours through these videos you will learn the Citizen’s Guide to America’s Constitution. You’ll learn what you need to do to help save our Constitutional Republic. It’s fun! It’s entertaining! And it’s going to inspire you to do your part to preserve freedom for future generations. It’s called Constitution Alive with David Barton and Rick Green. You can find out more information on our website now at WallBuilders.com. To go back to answer your question, you take a Founding Father like Benjamin Franklin, out of the 250, everybody will know him but he’s one of the least religious. And I do use the term “least” because that’s a comparative term. So, I’m going to give you a line from Franklin, a speech from Franklin, part of a speech that he gave at the Constitutional Convention. For two decades he’s been saying, “Guys!” So now he gets to sign the document that helps kind of birth that. Seven years later he’s one of only three guys who signed the peace treaty to end that. Now we’re getting really close. And four years later he’s sitting at the Constitutional Convention where we’re forming the United States. And he’s loving this, at least initially. Five weeks in he is not loving it anymore because five weeks in the convention is falling apart. All the delegations came with their own agendas. You had the New York plan, you had the New Jersey plan, the Connecticut plan, and Virginia plan, and guess what? New York didn’t want the Virginia plan, they wanted the New York plan. Nobody is agreeing. And Franklin’s watching this fall apart. He’s been wanting this for 33 years and he’s now watching it fall apart. He’s the old man of the convention, 81 years old, by far the elder statesman. Listen to what he says, “In this situation of this is assembly, groping as it were in the dark to find political truth and scarcely able to distinguish it when presented to us. How has it happened, Sir, that we have not hitherto once thought of humbly applying to the Father of lights to illuminate our understandings? “In the beginning of the contest with Britain when we were sensible of danger. We had daily prayers in this room for the divine protection. Our prayers, Sir, were heard and they were graciously answered. All of us who were engaged in the struggle must have observed frequent instances of a superintending Providence in our favor. “And have we now forgotten that powerful friend? Or do we imagine we no longer need his assistance? I have lived, Sir, a long time. And the longer I live the more convincing proofs I see of this truth, that God governs in the affairs of men. And if a sparrow cannot fall to the ground without his notice is it probable that an empire can rise without his aid? Now, here’s one of our five least religious Founding Fathers. And what you just heard was nine sentences. Here’s the question, the nine sentences you just heard, how many Bible verses did he quote? So is the guy that was raised in this kind of education where he was taught the Bible so it was going to come out in what he says. I recognize two or three. Thirteen Bible verses in 9 sentences? 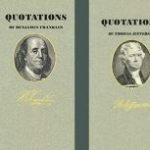 Franklin quoted 13 Bible verses in 9 sentences. So here you have your least religious Founding Father who knows the Bible that well because that’s how they were raised in that generation. Now, let’s shift to a Founding Father that no one is going to question his faith and that’s Patrick Henry. Patrick Henry was very outspoken. We’re going to go to March 23rd, 1775. We’re at St. John church in Richmond. The reason we’re a church is because that’s where the legislature met. So this is not church service. It’s not. The legislature is meeting there and they’ve had what’s called, “the Gunpowder Affair” where the governors come in and take the gunpowder away from all the Virginians. And by the British Bill of Rights, you can’t do that. They have the right to keep and bear arms, have the right to defend themselves. Now the governors come in, broken the British Bill of Rights because we haven’t separated from Great Britain yet. And the question is, “What are we going to do?” Well, Patrick Henry knew what to do. He sent and got 4,000 Virginia farmers, he got them all together, he climbed up on top of rock, he preached them a sermon out of Exodus 20, and then those 4,000 farmers went and attacked the 200 British soldiers and got all their gunpowder back. Here’s what Patrick Henry said, “Sir, we are not weak if we make a proper use of those means which the God of Nature has placed in our power. Three millions of people armed in the holy cause of liberty. And in such a country as that which we possess are invincible by any force which our enemy can send against us. Besides, Sir, we shall not fight our battles alone. There is a just God who presides over the destinies of nations. And who will raise up friends to fight our battles for us? The battle, Sir, is not to the strong alone it is to the Vigilant, the active, and the brave. Hey, friends! If you have been listening to WallBuilders Live for very long at all, you know how much we respect our veterans and how appreciative we are of the sacrifice they make to make our freedoms possible. One of the ways that we love to honor those veterans is to tell their stories here on WallBuilders Live. Once in awhile, we get an opportunity to interview veterans that have served on those front lines that have made incredible sacrifices have amazing stories that we want to share with the American people. One of the very special things we get to do is interview World War II veterans. 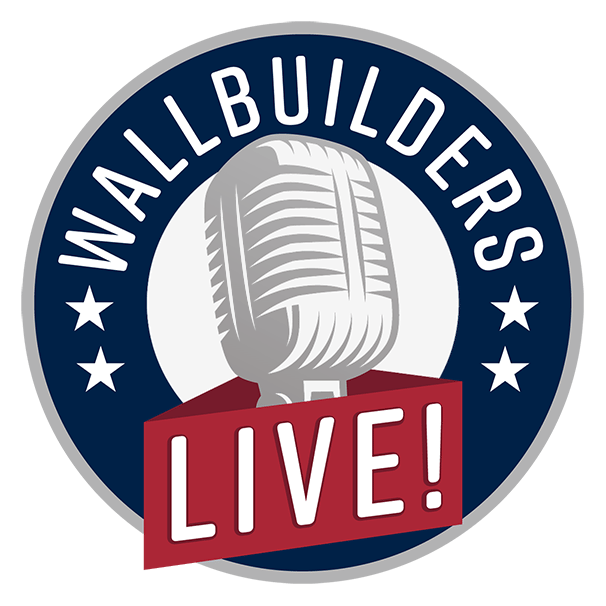 You’ve heard those interviews here on WallBuilders Live, from folks that were in the Band of Brothers, to folks like Edgar Harrell that survived the Indianapolis to so many other great stories you heard on WallBuilders Live. You have friends and family that also served. If you have World War II veterans in your family that you would like to have their story shared here on WallBuilders Live, please e-mail us at [email protected] Give us a brief summary of the story and we’ll set up an interview. Thanks so much for sharing here on WallBuilders Live! Would You Recognize The Bible If It Were Quoted? He made a very compelling argument. But I think today most folks would miss his argument. Because, again, in what he just did, that was 14 sentences. Same question, how many Bible verses did we just hear in 14 sentences? I’d probably recognize less out of that one. I’m not sure I could recognize any them. So, 11 Bible verses in 14 sentences. They know it, they recognized it. Today we need somebody to tell us, “I’m quoting the Bible” because we don’t recognize the Bible. Is George Washington Really A Deist? One more Founding Father. Here is a Founding Father that today we’re often told he’s a deist Founding Father, George Washington. George Washington is going to visit the various colonies. He is going around to visit these colonies, and he’s on his way to Rhode Island. And in Rhode Island, Newport there is a Hebrew Congregation in Newport. And they so appreciate everything he did for their civil and religious liberties. And so they wrote him a glowing letter of, “We just think God raised you up, and you’re such a wonderful leader, and we thank God for you.” And so George Washington responds back with a letter to the Hebrew Congregation in Newport. Now, that’s only two sentences, same question. And this is the supposed deist. No idea, in two sentences? Nine Bible verses. And they recognized them because most of them were out of the Old Testament. So that Hebrew Congregation, “Hey, we know all that.” There are a couple of New Testament verses he used as well. He didn’t have to reference them, he didn’t have to explain. He didn’t have to reference them, people knew them. We’ve come to the point where that we don’t know it. Why is it shameful? Why is this so important? We said it had a big impact on the generation but what’s the difference if we don’t have it today in our culture? Here’s here’s the difference, let me take this book right here. “Godless Constitution,” when somebody today says, “You have a Godless Constitution,” what they have just told me is that they are Biblically illiterate. They wouldn’t recognize a Bible verse if it bit them on the ankle. So, we’re back to not recognizing the idioms and not recognizing even in the constitution Biblical references. That’s right, even in the Constitution Bible verse after Bible verse in the Constitution. And what brought us to that point of success as a nation was the Bible undergirded even with Franklin. The Bible undergirded his thinking and what he said and how he communicated and they understood those principles because it’s not just religious stuff. This is true, tried, and tested principles that work. And if you use these things, and by the way we used them and it did work. Well, folks, we’re out of time for today. We’re almost finished with that first episode from Foundations of Freedom. It’s it’s called, “The Founders Bible” and we’re going to pick up the final conclusion of that tomorrow when we start WallBuilders Live. And then we’ll get the second episode with Michele Bachmann on the Foundations of Law. So be sure and join us tomorrow here on WallBuilders Live! I try to make it my daily food. Love this organization more than any. The constantly talk about my favorite subject. God bless wallbuilders .